Researchers map and control pulmonary fibrosis signalling pathway in preclinical trials. By uncovering the mechanism by which fibrous tissue cells in the lung multiply, researchers at The Children’s Hospital Los Angeles (CHLA), Keck School of Medicine, Nanjing Drum Tower Hospital, Instituto Nacional de Enfermedades Respiratorias, and McMaster University have identified a promising new approach for the treatment of pulmonary fibrosis. Idiopathic pulmonary fibrosis or IPF, where the disease appears spontaneously and without a known cause, is a severe, chronic lung disease in which the rapid growth of fibrous tissue results in increasingly severe breathing difficulties and a high mortality rate. The study is published in the Journal of Pathology. The team explain that excessive signaling of the growth factor TGF-β is recognized as a central player in lung fibrosis, and its increased expression has been identified in both IPF patients and experimental models of the disease. However, in addition to its pro-fibrotic effect, TGF-β signaling is essential to aspects of other systems, such as appropriate immune response. Therefore, complete therapeutic blockade of TGF-β pathway isn’t ideal. This is a very complicated signaling pathway, which promotes mesenchymal stem cell proliferation, while also acting as a tumour suppressant. The goal was to find a way to target specific cells that result in fibrosis without affecting other cells. Using a unique transgenic mouse model the researchers were able to manipulate TGF-β signaling in adult lung mesenchymal cells at selected stages of lung fibrosis. They showed that the progression of fibrosis mediated by TGF-β was independent of early inflammatory processes during initiation of fibrosis, an understanding that is vital in designing therapeutic strategies to stop its progression in IPF patients. Secondly, the current study identified a downstream gene called P4HA3 that is important to the overabundant collagen deposition associated with IPF. This gene encodes a component of prolyl 4-hydroxylase, a key enzyme in collagen synthesis. Inhibition of this enzyme was shown to reduce the TGF-β-stimulated collagen production in both cultured fibroblasts (connective tissue cells that produces collagen) and mouse models of lung fibrosis. The team surmise that the data indicates that increased expression of collagen prolyl hydroxylase is one of the important mechanisms underlying the proliferation of fibrous tissue that is mediated by TGF-β. Inhibiting this enzyme appears to be a promising therapy to interfere with excessive collagen production and deposition in IPF patients. Adult lung mesenchymal cells are specifically targeted by Tbx4 lung enhancer. 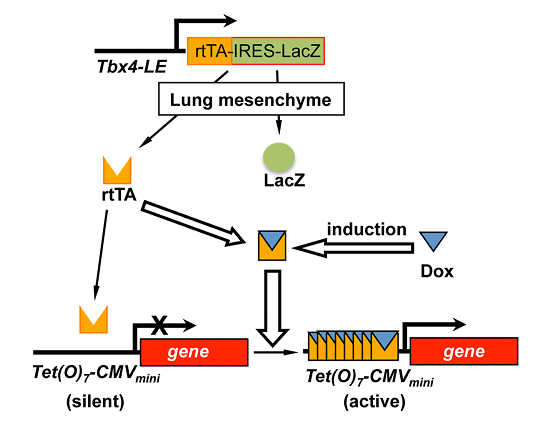 (A) Inducible transgenic expression (Cre or dnTβRII) in adult lung mesenchymal cells is controlled by a Tbx4 lung enhancer driven Tet-On system, shown by a schematic diagram. Expression of LacZ can be used as a marker for cells with active Tbx4 lung enhancer independent of Dox induction. A novel profibrotic mechanism mediated by TGF-β-stimulated collagen prolyl hydroxylase expression in fibrotic lung mesenchymal cells. Shi et al 2015.